This morning I rose earlier than usual to sub a yoga class at 8 am. I did my morning practices, got myself together and left for the studio in plenty of time. On my way, I pass by sod fields daily. The busy road bisects the lush spring green carpets of grass into north and south. Nearly every day a contingent of various white birds can be found plucking between the blades. When the fields are turned Sand Hill Cranes gather for big juicy worms and other delicacies the earth has to offer. Wood storks, ibis, egrets of every size and herons also dine here. On one side of the street there are telephone wires and daily at least one hawk can be found, head bent forward searching for moving morsels. Mourning doves, crows and a variety of other birds also frequent this resting spot and lookout. Late last year I began seeing a little funny looking loner. He was smallish, with a substantial pointy beak, seemingly as long as he was tall. 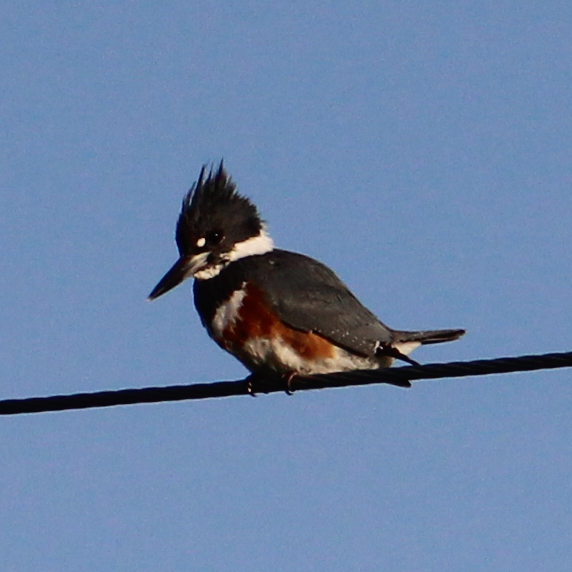 He had a bedhead mohawk and a white collar on his otherwise black body. 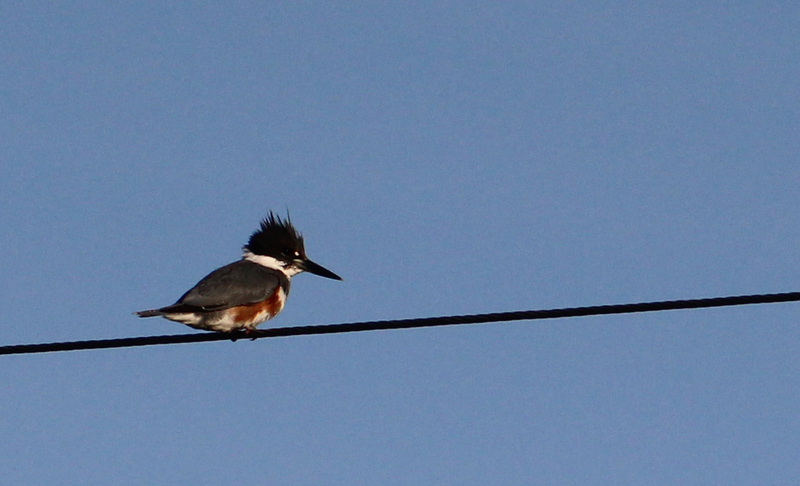 Kingfisher, I thought. Although I don’t recall having ever seen a kingfisher and don’t know exactly how that thought materialized. For months he teased me. I would grab my camera with the telephoto lens and set on the passenger seat of my car, just in case. On these days he was nowhere to be found. On the days I was in a hurry or forget my camera, there he was. He mocked my intentions. Today, as I was driving into the studio, habit forced my glance in the direction of the wires. Nothing. No hawks, no crows, nothing. I opened the studio, laid out my mat, turned on the lights and music, lit a few candles. I waited. No one showed. Was I there at the right time? Yes. Oh, it’s spring break. But still. I waited some more. At 8:10 I called it. I secured the studio and headed home. As I neared the sod fields I looked up. There. He. Was. For a split second I resigned myself to the fact that I was once again without my camera. But wait! Yesterday I had tucked it under my seat when I ran into the store (bad practice, don’t do it – but opportunistic for me today!). I pulled into the driving range across the street from my little guy. I tried capturing his tiny body from the south side, but wanted to be closer. I took advantage of the light Saturday morning traffic and crossed the 5 lanes. As soon as I landed on the north side of the fields he flew away. Nooooo! Then he popped back up, just farther away. I took his photo immediately, just in case he felt the need to continue with these shenanigans. But he stayed and I slowly stalked. He turned this way and that, showed me his right, left, front and back. I captured all of them. I thanked him profusely then gleefully skipped back across the street. It was clear to me in that moment that I was not meant to teach a yoga class this morning. I was guided instead to finally meet my elusive friend. Who, it turns out, is a she. 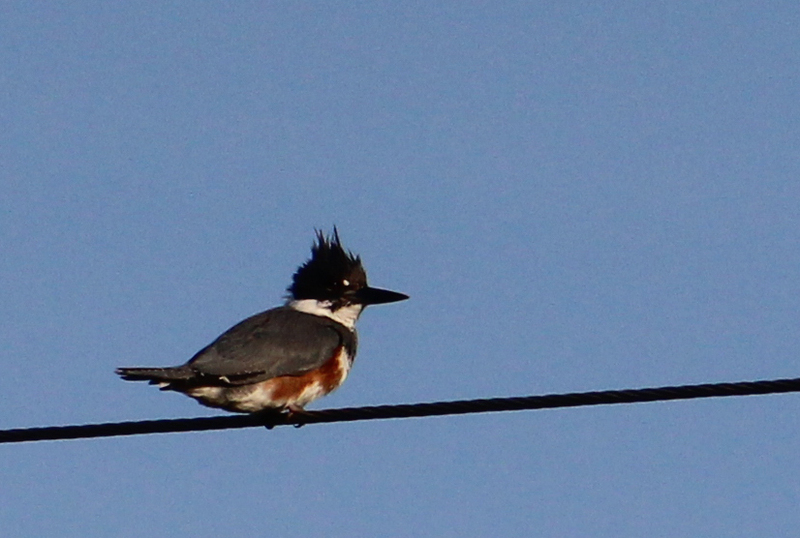 And she is a Belted Kingfisher.